So, I bet you’re wondering how Round 2 came about? To most people’s surprise #2 was very much planned, as was, #1. My husband and I have older brothers that are both 5 years older than us. With them being 5 years older there is a little bit of a disconnect. We decided that we wanted our children to be closer in age. When we first had Mykenzi we weren’t really sure how close, but after she turned a year old we started discussing it more and more. We decided that two years was a good number for a few reasons. Mainly we felt that a two year difference would allow for a close relationship growing up, especially if they end up being the same gender. Second, I’ll be 32 in March and if we decide we want #3, I want to make sure I’m within 35 to do that. Right now, there is no #3 in our plans, but I’ve learned to never say never. We decided in September that we would start trying in October after I visited my OBGYN for my yearly appointment. I wanted to make sure he was on board and discuss any risks I might endure with a second pregnancy after a C-section. He was very much on board and sent me on my way with a “Go For It” care package. That was Mid-October, I called him the first week of November to schedule a confirmation blood test. Apparently, I was ovulating the week of the appointment and my body knew what was up, wham, bam, thank you ma’am, Baking Baby Brown Round 2. The crazy thing about this pregnancy is there has been exactly 1 month’s difference between everything about this pregnancy and my pregnancy with Mykenzi, and finding out was identical to finding out with her. I knew to test because my hair started to get tender (like a hat head or ponytail all day feeling) which happened with Mykenzi, I just didn’t know it was pregnancy. I got my first positive with Mykenzi December 2nd, and Baby #2 was on November 2nd. Both showed up the faintest of faint pink lines before giving me the darkest pink lines on the 3rds of those months. We are due July 14th and Mykenzi’s Birthday is August 12th. So they’ll be almost exactly 1 month shy of 2 years apart, depending on when #2 makes their grand entrance. The majority of my cravings have been the same, sweets, sweets, sweets! And while I was extremely sick with Mykenzi, with this pregnancy I’ve been even sicker which I had no idea was possible. It’s been a rough first trimester but I’m hoping we’re on the up and up from here on out. I’ve already managed to land myself in the ER 2 times for dehydration and once for lack of “movement” in certain areas if you know what I mean, and if you don’t well, it rhymes with “towel” movement. Yeah, you don’t have any of those and they want to admit you in the hospital. Ain’t nobody got time for that! I’ve been a royal hot mess, y’all, which is why blogging has been extremely quiet past couple of months. But, I’m back! And I’m looking forward to jotting down all my weekly bumpdates as I did with Mykenzi. 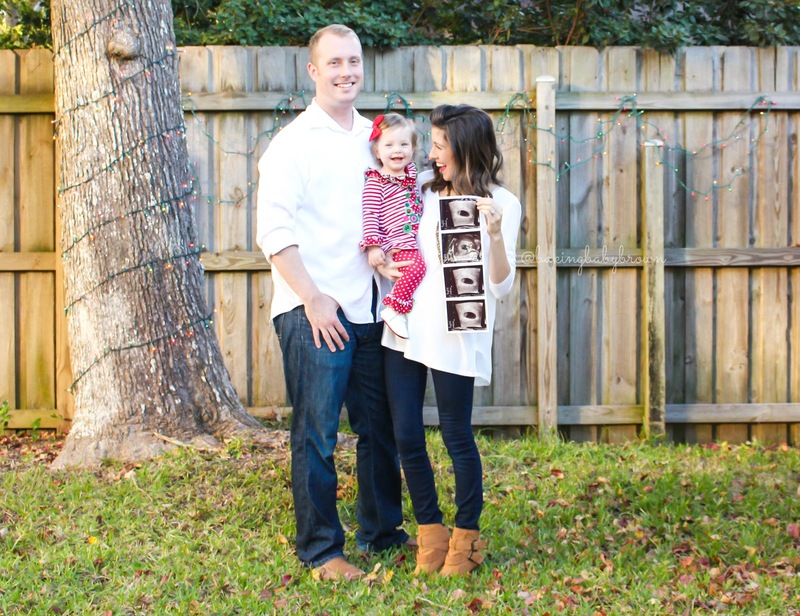 Tell me, were your second pregnancies identical or different from your firsts? And what were your gender outcomes? OH, I almost forgot the best part! We get to find out the gender in 2 weeks! Apparently, they can do it by blood test now in your first trimester! We got my blood drawn for it last Tuesday and are anxiously awaiting on pins an needles to hear the news! Congratulations!!! Pregnancy excitement is the best!!!! Cute announcement! Hope the Nausea subsides soon! So so happy for you! All of my pregnancies have been different. The last one,with Harper, I couldnt keep my eyes open from fatigue and I didnt think Id survive. This time I feel so amazing and often like Im not even pregnant. Four girls over here! Even though I was so sure this fourth was a boy! eek!! So so happy for y'all!! I cannot wait to see your weekly progress. Pregnancy looks good on you, mama! Hopefully I'm not too far behind you! So excited for you friend!!! But I'm sorry you've been so sick. ER twice? You poor thing!! 2016 is going to be a great year for you. XOXO And I'm definitely ready for #2…just waiting for "the stars to align." Hahahaha.